Eighteen months of intense negotiations with the de facto leaders of the three remaining Ituri Armed Groups (IAGs) reached a climax level on 2 November 2007 when a MONUC special flight carrying 16 disarmed top leadership of IAGs departed Bunia at exactly 13:00 hours for Kinshasa. The departure of these leaders from Bunia marks a dramatic step forward in the consolidation of the peace process in Ituri and signals a possibility of ending more than 8 years of conflict. 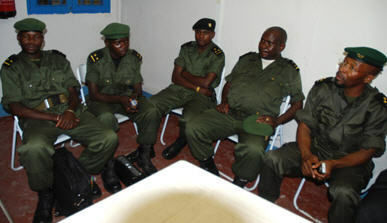 The former militia leaders: Cobra Matata of Front de Resistance Patriotique en Ituri (FRPI); Peter Karim of Front des Nationalistes Integrationnistes (FNI); and Mathieu Ngudjolo of Mouvement Revolutionnaire Congolais (MRC) and their top former combatants were escorted from Bunia by Colonel Abdalah Nyembo (FARDC second in Command in Ituri) and Professor Ntumba Luaba, Head of the National DDR Programme. According to General Kinkela, FARDC Zone Operations Commander, the 16 former militias accepted to proceed for training in Kinshasa while the majority of their disarmed elements (about 300) will be airlifted to Kitona for brassage. Meanwhile, another 44 ex-combatants associated to the three groups were airlifted by a special commercial flight organized by the GoDRC. The flight is scheduled to return to Ituri tomorrow (3 November) to transport more former combatants. According to General Kinkela, a total of 150 elements will be airlifted to Kitona for brassage.